You’re doing it wrong, keep it up! Maybe all of this seems a bit much, but the point is this: each of these opportunities builds on the last, as the child learns through his own real life experience how to hold a glass of water. Through repetition, that is, through repeatedly doing something “wrong”, he learned how to meet his own goal (to get water from one vessel into another). In the early days of incorporating Montessori into our own home though, I’d be disappointed when I introduced a new activity or material and it seemed like my little guy just couldn’t get the hang of it. My expectations were based on things I’d seen other kids do online, or read about in a book, or seen in a film (and one really simple error I occasionally made as a first time mom was not understanding the very real difference between, say, a 17 month old and a 20 month old). At this point in the journey, I’ve come to realize this: if you offer a child an empty glass and an appropriately sized pitcher of water for the first time ever, and they have no problem pouring a glass without spilling a drop, you’ve waited too long. Spills, messes, challenges, frustration — it’s all part of the process, of learning, of doing hard things. Fear of failure? It’s got no place here. A parent doesn’t need to say a thing — that wee genius knows what he’s attempting and whether it’s been successful. “The teacher should never intervene in an action when the impulse prompting it is good, neither with her approval nor with her help nor with a lesson or correction,” Maria Montessori wrote in Some Words of Advice to Teachers. Today’s challenge: let’s offer opportunities to our kids (and to ourselves), to try something and not quite get it. To pour the water on the floor, to climb up the wrong side of the slide, to put their shoes on the wrong feet. And then let’s smile and watch them try again. Do we follow each other on Instagram? Let’s! Click here for an Instagram video of a very wee Jasper pouring himself a drink a long while back, and hit follow while you’re there. But here’s a big ol’ secret: Sage has never been put into “tummy time.” She’s spent lots of time on her belly, but I didn’t put her into that position. Instead, from just a few weeks old, she’s been put onto her back, with plenty of space to move freely, occasionally with a few toys to invite exploration. Her body and brain are developing, and all she needs is time and space. Natural human development will take care of the rest. We avoided or minimized time in what I call “contraptions” — swings, car seats, Jolly Jumpers, bouncy chairs, etc. They are all used to contain and restrain a baby’s natural freedom of movement. By holding back a baby’s natural way of being, they are holding back development. Even if it is high contrast, or brightly coloured, or play sweet music. Of course, we used a car seat in a car, and I put her in a (non-automated) bouncy chair while I showered. But I worked to be mindful of the time spent using these devices. At 11 weeks old, she rolled over onto her belly for the first time. A few weeks later, she rolled back from belly to back. Since then she’s been on the move, rolling, stretching, creeping, pulling herself along. A few weeks ago, she started to get up on all fours and rock. On her six-month birthday, in the middle of Thanksgiving celebrations, she moved from the crawling position to sitting right up. She sat there for about thirty seconds, with family gathered around cheering her on and my jaw on the floor. At nearly seven months, this sweet girl is (nearly) all grown up and sitting up with confidence. She gets herself into that position, and she holds herself up as long as she’s interested in sitting. No pillows, no props, no Bumbos. When she’s done sitting, she leans back, she rolls onto her side, she flips onto her belly. It’s her body, and it’s her choice. Those words might seem a little intense, conjuring up ideas of consent and women’s rights. But I think it’s okay for my daughter to have the idea that she is in charge of her own body, even from an early age. She leads the way. I was introduce to ideas about baby’s natural motor development through the idea of RIE and in particular Janet Lansbury’s blog, which is excellent. I’m currently listening to her audiobook No Bad Kids: Toddler Discipline Without Shame and wow, you guys. If you have a toddler or preschooler, that book can really do wonders for the communication around your household. If you will soon have a child that age, get started now! Here are a few of Janet Lansbury’s posts about sitting and tummy time. Edited to add: A reader posted a comment noting that focusing on timelines might give the incorrect impression that this method leads to early development. That’s not the case. 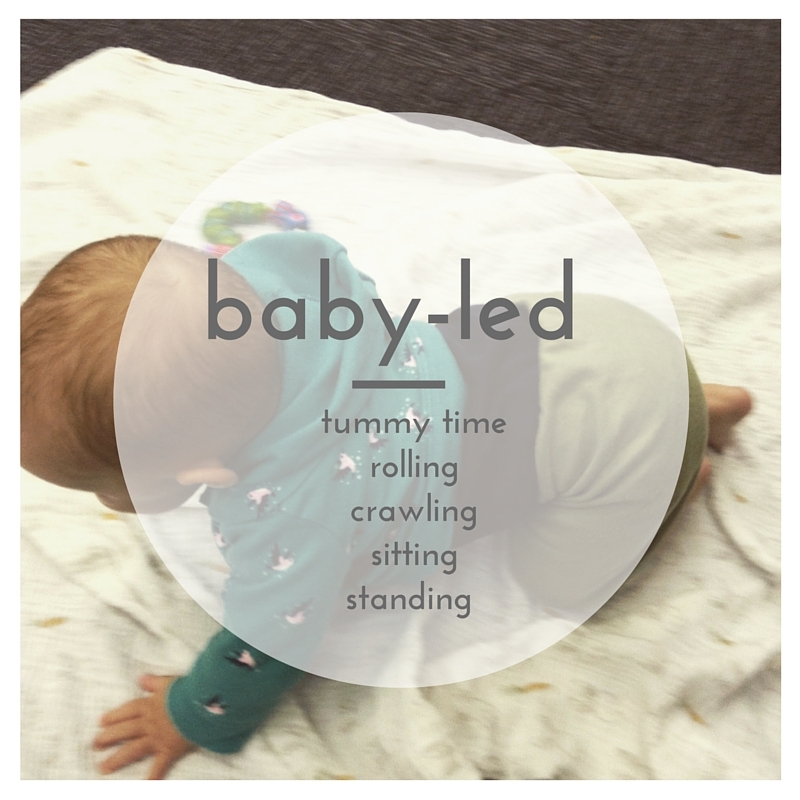 Letting your baby lead the way allows them to develop at their own pace. There is no rush, and there’s no need to slow down. If your baby seems “late,” don’t despair. I think what this is all about it is giving your baby the respect, the space and also the time he or she needs to use their body and naturally develop. Thanks for your note, Gina!